Out for a short walk in the Sicilian countryside on the last day of February, I found this rather mysterious dark wild iris. As soon as we have one warm gloriously sunny day, this flower pops up from the damp soil in the midst of tangled undergrowth. It blooms briefly, so you have to be on the lookout for it. It has a fine delicate scent that is the essence of spring, and the lush velvety petals that invite honeybees for a rest. This is the hermodactylus tuberosus, commonly known as Snake’s Head Iris or Widow Iris. In Sicily, many people call this iris Il Bastone di San Giuseppe, St. Joseph’s cane or staff. San Giuseppe is often portrayed with his staff topped with flowers, recalling the legend of how Mary’s spouse was chosen by collecting walking sticks of potential husbands, and Joseph’s alone burst into flower, thus identifying him as divinely chosen. The iris is supposed to bloom around the time of San Giuseppe’s feast day, March 19, a feast day heavily celebrated in Sicily, when breads are made in elaborate shapes including one that depicts his staff with this 3-petaled iris. (Actually St. Joseph is often depicted with a lily blooming from his cane, not an iris, but I hesitate to be a party-pooper and go along with the Sicilian tradition.) 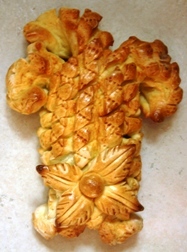 We learn how to make these festival breads at other times of the year on our Walking & Cooking Tour in Eastern Sicily. In case you think I just happen to see a flower and say “Oh, isn’t that a lovely hermodactylus tuberosus,” I’m not being a dorky Latin show-off, I’ve been studying! I’ve found the best guide book for wildflowers in Sicily and southern Italy: “Wild Flowers of the Mediterranean – A Complete Guide to the Islands and Coastal Regions, by Marjorie Blamey & Christopher Grey-Wilson. Since it’s a bit heavy (1 ½ lbs) to tote on a walk, I often take pictures of unfamiliar flowers and later use the book as a reference. It contains an index of English names as well as Latin names for flowers, and 2700 color illustrations, plus excellent descriptive text. I purchased mine through Amazon UK for about 17 pounds sterling.